In this issue: Hank and Jan fight the Commies! Yes, again. They may not be showing up as de facto baddies nearly as often as they did two years - evidence of a slightly less-crimson Red Fear, or just the result of Stan creating more inventive and compelling villains? - but they're certainly never absent for long. Specifically, this is yet another tale where the villain is a barbaric Communist dictator, this time of the republic of Santo Rico. (Seriously, how many random fictitious countries can Stan create? We'll soon need a map!) The country in question, previously a peace-loving democracy, has elected their new vermillion leader in a landslide victory, eliciting more than a faint whiff of suspicion from international shores. As a result, Washington D.C. calls upon Ant-Man and the Wasp to investigate - and so, being proud and patriotic citizens, off they go! So, the Red dictator in question? El Toro. Yes, "the bull". (And let's reflect too on the historical connection between bulls and the color red.) It's hard to say definitively whether or not he's actually got superpowers, as his only talent - aside from hysteria and megalomania - is his dramatic battering action. In other words, we may have just found the antecedent for 1980s Masters of the Universe toy Ram-Man. 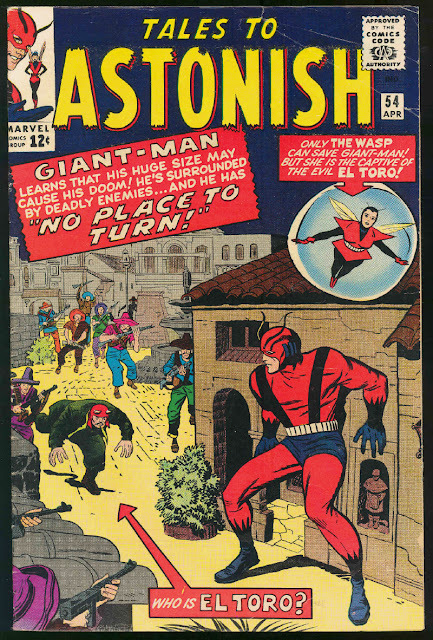 As you might expect, this villain was definitely a one-hit blunder ... until, astonishingly, he was brought back by writer Steve Englehart in a 1988 West Coast Avengers tale that united El Toro with other forgotten Ant-Man foes like Madame X, The Voice, and - I kid you not - the fantastic Scarlet Beetle. Giant-Man hasn't been this much of a klutz since he first fought the Human Top! Meanwhile, in the latest instalment of "The Wonderful Wasp Tells a Tale! ", we're treated to a story of: "Conquest!" And it provides an interesting contrast with the lead story in Journey into Mystery #102, out on the stands that very same week. In that issue, the people of Zarrko's future era were all so happy and contented that they lost all sense of ambition or self-preservation, allowing for the uprise of their one bad seed. Here, the utopia creates the opposite problem: The populace is so cared for and sated that they've become complacent and now take their ruler, King Shann, for granted. Cognizant that his subjects are no longer awed by his majesty, Shann therefore concocts a plan to win back their admiration through the excitement of conquering a nearby world! What follows in this remarkably tiny story is at once hokey and contrived (as any 5-pager is bound to be), yet with an underlying sensibility that's surprisingly mature in its subject matter. After all, Shann's world conquers their neighbor without too much trouble, and the soldiers we see do seem to be revitalized by the thrill of attack. However, the subjugated planet must of course be cared for after the war, and both Shann and his subjects are soon distressed to learn just how much of a drain such support is upon their economy. The dialogue may lack nuance, but the message is clear: War can invite glory and fame, but the reality of the after effects are lasting. The contrast between this story and JIM #102 is so astonishing because this was - like all the Wasp backup stories of this run - drawn and scripted by Larry Lieber, who in his previous scripting efforts often lacked compelling motivations; yet the bland (and frankly unbelievable) future of Zarrko was written by Stan, whose success in the genre has come about largely due to his talent for the same. So it's interesting that, this one week in January 1964, the brothers had a bit of a switch! he fled to another dimension and took a new name...?